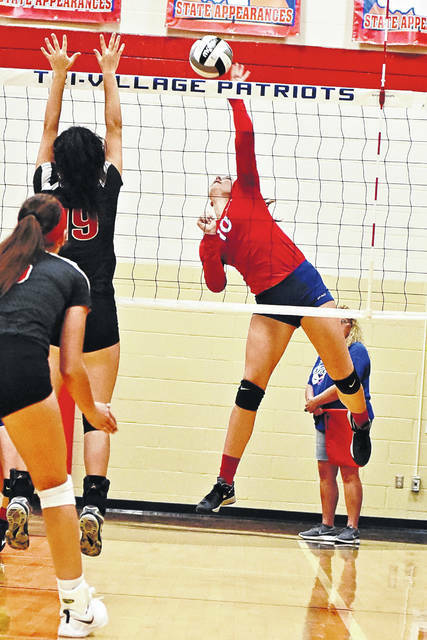 Maddie Downing goes up for a block during Tri-Village’s volleyball match Monday night with Preble Shawnee. Downing and the Patriots won the match in three games. Abbie Lipps sets up a teammate for a shot during Tri-Village’s volleyball match Monday night with Preble Shawnee. Lipps and the Patriots won the match in three games. Breann Lipps sends a shot back across the net during Tri-Village’s volleyball match Monday night with Preble Shawnee. The Patriots won the match in three games. Edie Morris digs one out on defense during Tri-Village’s volleyball match Monday night with Preble Shawnee. The Patriots won the match in three games. Kelsie Wehr keeps a point alive with this save during Tri-Village’s volleyball match Monday night with Preble Shawnee. The Patriots won the match in three games. Maria Petry sends a shot back across the net during Tri-Village’s volleyball match Monday night with Preble Shawnee. The Patriots won the match in three games. Meghan Downing hits a hard smash back across the net during Tri-Village’s volleyball match Monday night with Preble Shawnee. The Patriots won the match in three games. 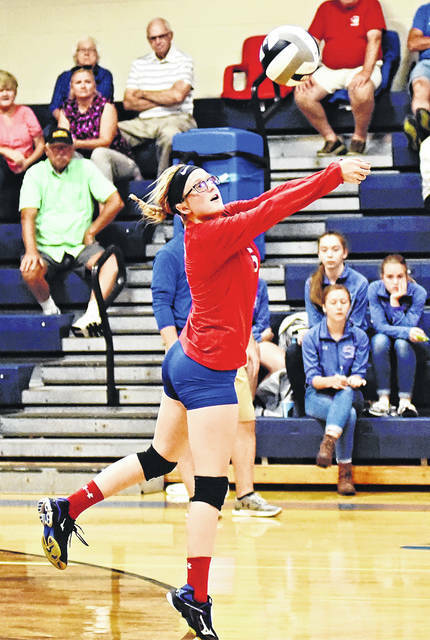 NEW MADISON – The Tri-Village girls volleyball team came out focused in their non-league contest with Preble Shawnee Monday night and took the match in three straight sets winning 25-18, 25-10 and 25-17. 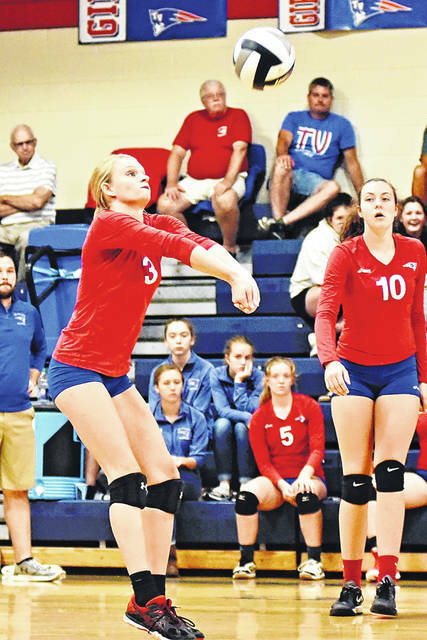 Tri-Village girls coach Chris Brewer was expecting a good match with Preble Shawnee, a team that took them to five sets last year with a similar cast this year. “We wanted to come out, work hard and have fun tonight,” Brewer said. “It seems like we are a little hard on ourselves at times and tonight they had fun the whole time. They hustled, covered well and when they had opportunities they put the ball away. We hit very smart tonight, which we don’t do often and I’m glad. We found our spots, tipped when we needed and were very efficient. 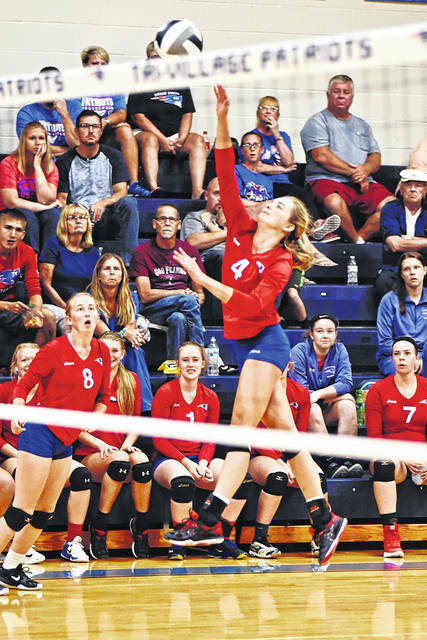 Abbi Lipps helped establish the Patriots game with 14 assists on the night along with a strong service game of 22 points and 4 aces on the night. Her long runs at the service line helped put Preble Shawnee in the hole at critical times in sets 1 and 3. 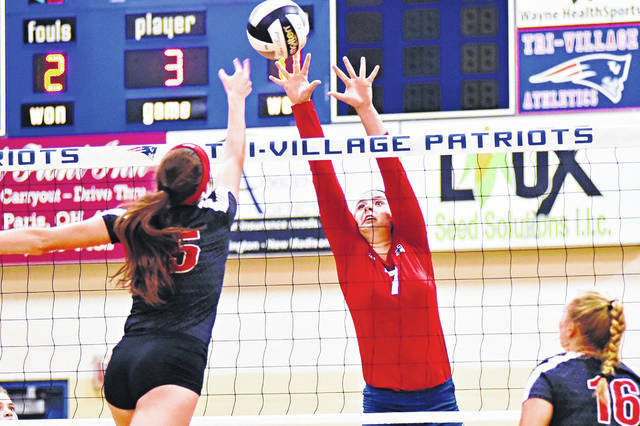 On the front line, the Patriots had 14 blocks with Maddie and Meghan Downing along with Maria Petry doing damage up-front. Maddie also registered 8 kills to lead the team. 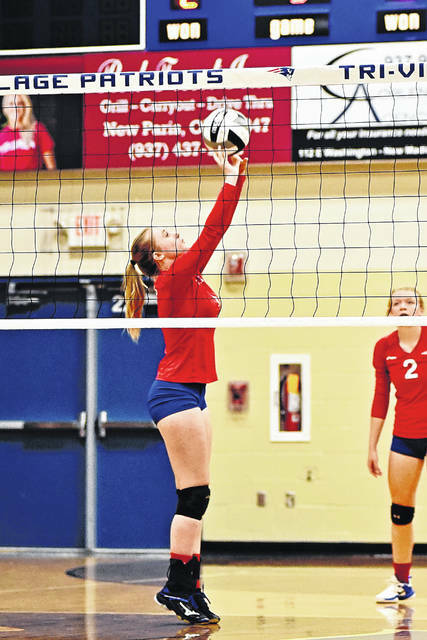 Kelsie Wehr had 12 digs and 5 kills and Jadyn Sharp added 12 digs for Tri-Village. “At the beginning of the year we had some miscommunication issues in not being comfortable with each other and knowing who was going to cover where and who’s getting what ball, but as the season has gone along they are getting comfortable and sure of themselves,” Brewer stated. “We’re now getting into the meat of our schedule. We have Milton-Union on Saturday who is really good, FM and Arcanum so we have some tough games here at the end. I like that as it will prepare us for the postseason tournament. The key this year is we are winning the games were supposed to win, but I would love to get one of those down that stretch were not supposed win and find a way to win won,” Brewer concluded. Tri-Village improves to 12-2 overall and with just one loss in the league to Miami East and some key conference game coming up they are still in the hunt, but will need to take care of business on Thursday when they will travel to Pleasant Hill to take on the Newton Indians. 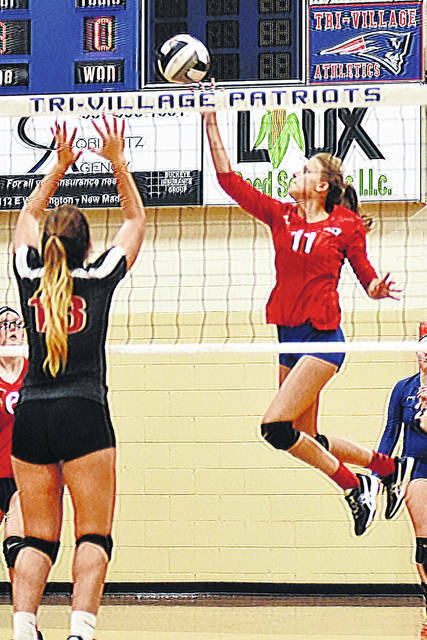 This entry was tagged CCC, Patriots, Preble Shawnee, Tri-Village volleyball. Bookmark the permalink.